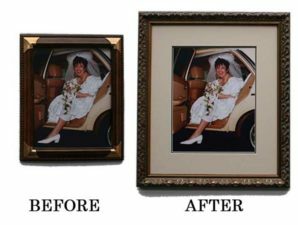 Do you have older photos and frames that together are looking a little dated? 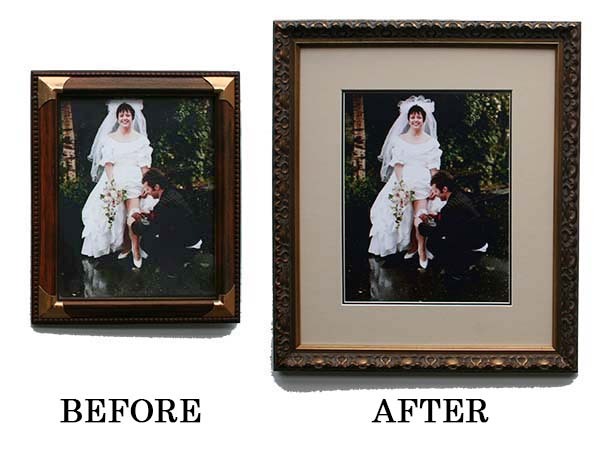 Bring them to us at Fine Framers, and we can give them a whole new look. We’re regularly involved in reframing photos for customers. In many cases, the customer originally framed the photos in low quality ready-made frames, without mounts. This means the photos were in direct contact with the glass, which often leads to damage caused by the photo sticking permanently to that glass. Another common problem is how photos have faded after being exposed to direct sunlight. 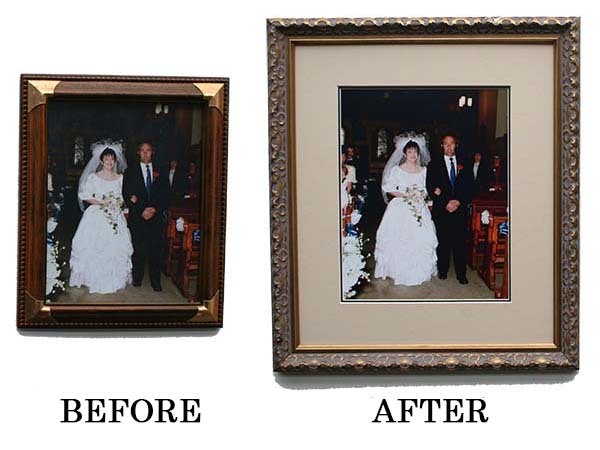 The first step is therefore for one of our photo restoration experts to create a vivid re-print of the photos. We can repair any marks, stains, or fading before we do new prints. We still guard your original prints, and we return these to you too. We next go to work on re-framing the photos. 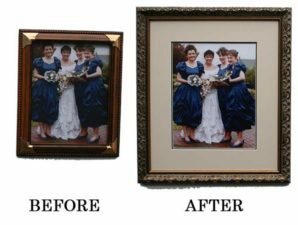 You have the usual wide choice of all our custom picture frames, or you may find we already have high-quality readymade frames to suit. Either way, we guarantee you high quality and excellence. An example of photo re-framing we did is a recent project for our staff member Ella. She and her husband were celebrating 25 years of marriage, and decided to find a better way to display their wedding photos. The original photos were in relatively good conditions. However, we nevertheless scanned them, touched them up, and printed a vivid new set, for optimal results. We then mounted them with a complimentary double mount. This gave some space around the photos and allowed separation between them and the frame. It also provided the air space they require between the photos and the glass. Another benefit is that it makes the photos appear larger, as you can see in examples below. We then framed the new prints in one of our classic wedding mouldings, giving a very good look overall. This included putting some themed photos together in multi-aperture frames. See examples above and below to see the difference our work made. 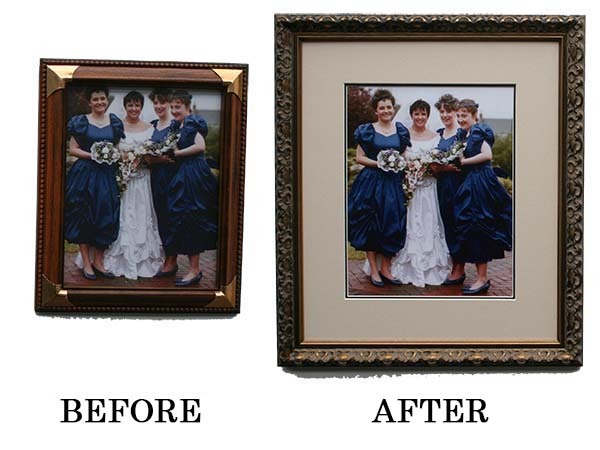 If you would like us to do photo re-framing for you, just get in touch through our Contact Us page or by phone if you have any questions first. Alternatively, just call to see us in the Wexford Road Business Park on the outskirts of Carlow. We’ll look forward to talking to you. What is the capital letter of t?